According to Gartner analyst David Cappuccio, companies that have adopted virtualization are only reaching about 25% server utilization. “Easily more than half of the clients we talk with have this situation,” he says. This inefficiency is wasteful because a physical server utilizing only 25% of its processing capacity is still consuming energy at a rate of about 80% of its power requirements. If you are able to get utilization up towards 70%, then power consumption only increases marginally to about 85%. Occasionally, some will attempt to run multiple workloads within a single virtual OS instance. However, running more than one workload in a single virtual instance is problematic because there isn’t any good way to guarantee those cohabiting workloads running in an OS instance are isolated from one another in a way that will allow required SLAs to be met. Instead, IT shops have relied on virtualization to carve-out a full VM for each application workload and allow the OS to handle the rest. A typical three-tier application, for instance, would run on three separate VMs. When we work with customers, we commonly see IT provision standard 4GB VMs (sometimes as high as 8 GB). Unfortunately, this is a very wasteful strategy considering that the average .NET or Java application component generally requires a maximum of 500 MB. Why does IT provision such large VMs for processes that only require so little real capacity? because existing internal processes are so cumbersome that developers request the largest VM size just in case. This low utilization and VM sprawl is unnecessary waste. Our customers consistently see utilization rates of 60-80% depending on the nature of the workloads. Spikey transactional workloads will require extra headroom, whereas application portfolios with more static and predictable workloads require less overhead. Apprenda is a different kind of platform. While virtualization uses VMs as a first class container to segregate applications, Apprenda pools VMs and physical OS instances together, and “carves them up” into smaller parts, allowing applications to co-habit the OS instances themselves. Apprenda’s platform offers full application isolation within OS instances, along with the ability for IT to choose what Resource Policies (definable resource quotas) it would like to offer to its developer end-users. For instance, a large banking customer with highly transactional, spikey workloads offers only two policies: a small one of 1GB and a large one of 4GB. Additionally, CPU cycle commitments and core distributions (single core, multi core) can be defined. Apprenda guarantees that it can carve out those resource commitments within an individual OS, rather than dedicating a whole VM to an application component. Because Apprenda is handling the resource isolation for the application workloads, there isn’t any need to also cover operating system resources; you only need to cover the memory and compute for the workload. The resource policy is much more efficient, virtually eliminating the excess waste of using virtualization containers. Rather than using the “classic” practice of “scaling up” by adding additional VMs, Apprenda allows you to use smaller policies that can easily be scaled out horizontally. This provides the additional benefit of parallel execution of operations, which also serves to improve overall performance. This, by the way, is exactly how all modern cloud services are architected. Interestingly, Apprenda customer JPMorgan found that because Apprenda makes it so easy to scale out or change resource policies, over 75% of the thousands of workloads that JPMorgan Chase runs on Apprenda use a small 1 GB policy. Other customers with less transactional workloads find that 500 MB is plenty. Increased utilization has an enormous positive impact on cost reduction. 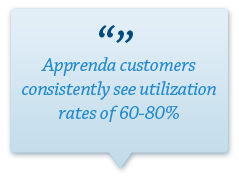 By increasing utilization, Apprenda customers require less physical machines, which reduces CapEx, data center power consumption and often other licensing that is tied to physical machines. Also, consider the many downstream costs associated with improved utilization such as patching, monitoring, backup, disaster recovery, etc. Some of our customers outsource the management of their infrastructure to a third party who bills them a few hundred dollars for each VM plus each physical machine. Apprenda customers can save millions of dollars on their outsourcing bill. For the next post I’ll explain how many customers are reducing or eliminating virtualization costs. Contact our account team if you would like a custom ROI business case developed that will show you just how much you can start saving today.